On Wednesday my bike is parked at the spot where a fellow cyclist was killed Tuesday. The roadside spot where Albany bicyclist Grant Keith Garner died on Tuesday is on one of my regular bike-riding routes, and I extend my heartfelt condolences to Garner’s family and others who knew him. 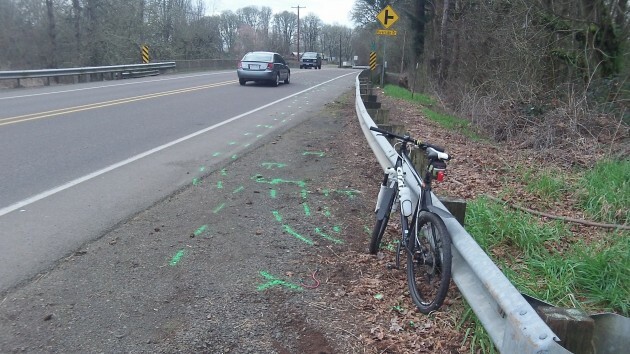 As an accident it was an unusual one, but the crash that killed Garner, 60, shows why cyclists wish there were more off-highway pathways of the kind the Benton County Planning Commission has now rejected. Garner was on his bike on Tuesday afternoon not for fun or exercise but to get home after work. The Democrat-Herald reported he had lost an eye as a boy and could not get a driver’s license, so he rode the bus back and forth to Corvallis and got on his bike to complete the commute to his home off Riverside Drive. At about 5:45 Tuesday afternoon, a car coming the other way, driven by a 24-year-old woman from Corvallis, failed to make the curve on Oakville, caromed back and forth and hit Garner on his bike just as he was about to start crossing a bridge across an unnamed slough. (Not the Calapooia River, which is farther east.) If he saw the car coming at all, it was probably too late to bail out toward the right. In any case, a guardrail there would have blocked him in. On Wednesday there was a fragment of a bike’s taillight on the ground just where the guardrail starts. Highway signs recommend 30 mph as the safe speed for motorists to round the corner where Oakville turns east in one direction, to become Queen Avenue, and south in the other. (Motorists know from experience you can go 10 mph faster than those yellow warnings and still be fine.) The sheriff’s office said that “speed has not been ruled out” as the reason why the car, a 2000 Subaru Legacy, went out of control. Bicyclists are aware of the possibility of being mowed down by passing traffic, which is why the proposed path away from Highway 20 between Albany and Corvallis was so popular among the cycling community. On Tuesday night the Benton planning commission unanimously rejected a conditional use permit sought by Benton County, and it looks to me as though this project is now dead. Appeals won’t do any good, because the reasons for which the path was rejected — mainly the disruption of farm operations along the way — will be just as persuasive to the Land Use Board of Appeals if it goes that far. Hasso, to your last point, I agree….A direct Albany to Corvallis Bicycle path, and a SAFE one, is a worthy goal. Bicyclists want an “auto-free” route. That’s not 100% practical. I have driven Highway 20 between Albany and Corvallis regularly for 40+ years……and except for the stretch between (which has approved routing as I understand it) Springhill Road and Independence Road….all is good. Beyond that, headed toward Corvallis, the highway shoulders are MORE than adequate, and additionally, the recommended speed from just SW of Garland Nursery to Conifer Road (and beyond) is reduced to 50 mph and 45 mph as one approaches Conifer. To me., Riverside Drive is less “bicycle-friendly” than Hwy 20, but I’ll let those who pedal make that case……..Those shoulders are narrow. Perhaps the bicycle community can settle for LESS than everything they’d like? We’re only talking about maybe 3 miles on Hwy 20, aren’t we? Three miles, if that… (Garland Nursery to Conifer Road) with reduced speeds and a nice. wide shoulder….with no modifications? Utopia is a ideal. Reality is different. James, I disagree. The path would have been paid for and out of traffic. I would allow my minor children to use a path completely off the highway, but never on the shoulder. The article on Tom Denison had 6 pictures of him and his farm, not even one illustration of the proposed path. The ideal was well within our means, giving up 30 million dollars in federal money was a terrible mistake. And to your idea, reduced speeds and wide shoulders, how can we expect reduced speeds on highway 20? There is no room for a passing lane on that highway. ODOT does not even allow more traffic lights there. The turn from Granger onto highway 20 is very dangerous, many injury causing accidents. 3 miles, 60 foot wide right of way, VS 30 million dollars lost. And the turns near Garland are particularly dangerous. Perhaps you could explain. 60-foot right of way? Three miles? What are we talking about? How many times are we as human beings “in the right place at the right time”, or in this case “in the wrong place at the wrong time”? I believe we are taken from this earth and called by God to a higher place, and in most instances, the family and friends left behind have a terrible time understanding it. My condolences to his family. Truly, Mr. Garner was doing what his normal routine asked him to, but this time a driver from the opposite direction didn’t control the right-handed turn from Oakville Road and their car ended up hitting Mr. Garner in the shoulder of the westbound road before he normally turns onto Riverside Drive. A terrible, terrible accident! I have to say this isn’t the first time motorists have had a hard time dealing with this corner. Many years ago, in a full car coming home from the coast, my father was very tired when we came upon this corner at night. We had to brake hard and turn at the last moment to make it! I can also say I have ridden my bike with a friend in junior high to Corvallis, from Liberty street to Queen and then Riverside Drive. A fun experience, but if I were a biker now, I would stay in town! No way would I ride on a highway shoulder, Hwy. 20, 34, or even 101! I am lucky I do not have to depend on my bike to go places like so many these days. My opinion of providing a bike path here in our area? Still, widen Riverside Drive and create the path from it’s west end to the Willamette River at Corvallis. Bicycling to me is recreation, not the prevailing form of transportation. Even if corporations want to foot the bill for bike paths, it’s still going to be a tough road to hoe. This article is about my father. I’ve really had a rough time since he died. Still so hard to believe. Silly, the 30 million dollars the county gave up would have purchased the farm in question many times over. We need the bike lane and it would have been paid for. Now because of a handful of people, (and one in particular). the public is a loser. A friend of mine fell off his bike on Highway 20 due to uneven pavement in 2002 and broke his hip.